The walk starts at Bimont Dam, half an hour by bus from Aix en Provence. People are quite open for hitchhiking, but not many cars drive along. 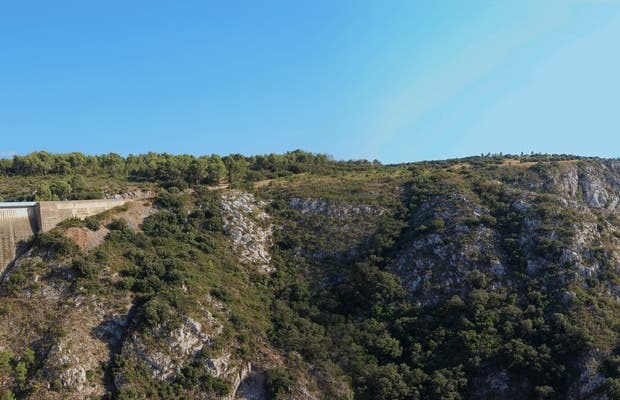 The trail leads to the top of the hill of Sainte Victoire, which is described by the famous French writer Marcel Pagnol in the stories of his childhood. Upstairs is a shelter where you can sleep, without much comfort, you will have to bring it all with you, water, sleeping bags and you might need to light a fire because it's cold! The shelter is free, but they may have other groups there and therefore no enough room. The views of the hills of Provence are wonderful and the weather is great from March to October.